Commercial drones are gaining increasing popularity in recent times as many businesses are utilizing commercial drones to provide value-added services for their clients. The list of services that can be provided with great quality is very encouraging. 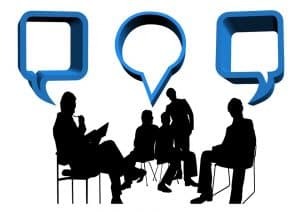 The end result of such services is unparalled with guaranteed customer satisfaction and an exponential increase in business. A couple of areas in which the usage of commercial drones is fast growing are; The real estate where the agent can take beautiful videos of a property for sale, while a photographer can capture some great aerial photography. The farmer can keep an eye on livestock or crops without having to drive long distances. Film crew may wish to gain some beautiful exterior video shots for their film, or a videographer may wish to provide value-added services for weddings, concerts, or other events. It’s becomes immensely important for a business to invest in a long range RC drone where time gets converted to money. Imagine a situation where a photographer ends up with a dead battery and needs to replace it with a new fully charged pack; the situation may not always be favourable as he might not be carrying a spare battery all the time and there may be no resources to charge the existing one. Also who has time to do all that these days. If you have a battery, once charged goes on for as long as your days job last, it gets very handy. There are also many long range quadcopter lovers who want only the best long distance drone, even though a good one costs from $260 and goes upwards to $1900. So if you are looking for some commercial drones with advanced technology that can fit your purpose and your pocket, here are our 7 of the best industry standard long range drones on the market today. The Parrot Bebop is a long range drone that’s available in two great colour choices of blue or red with black. It has a built-in camera in the central part of its body. This one has been designed with safety in mind, and can actually be flown on indoor or outdoor adventures. It comes with a tough robust body that can keep the motor and mechanics protected even when it gets a bit windy, or the pilot is a novice beginner. It is extremely lightweight, sleek and stylish and has a built-in 1080p full HD video camera. It weighs just about 400 grams and is made from fibreglass-reinforced ABS materials. Should you choose to fly your Parrot indoors, it comes with a special attachable and removable hull to protect it from the walls. For people who are only seeking a toy, its range won’t matter at all. This long range drone as opposed to other drones in the market does not come with a separate radio controller unit. To operate the Bebop you must download an app to your smart phone or tablet. You’ll be delighted with the responsiveness of the interface’s touch controls. The Parrot Bebop long range drone has been engineered with fully digital 3-axis image-stabilization technology. This enables it to snap clear photographs, no matter what speed it’s flying, or even if the wind is making it a bit shaky. If you take your fingers off the controls while flying, it’ll hold its position and await for further instructions, rather than taking off and being lost in mid-air. Should it hit an object while flying, the propellers will automatically lock itself and prevent any further damage to the device. This best of the long range drones is equipped with a camera that can take stunning photographs of 14 megapixels. This also has a wide-angle lens and is resistant to bumps, dusts,and water. It is capable of recording high definition photos and videos. The pro will love how they can save their images in JPG, DNG or RAW formats. The digital image stabilisation technology will help even the beginner to take crystal clear photographs. Another great feature is that whether you take photos or video, the horizon will always be perfectly straight. Some sports or long range RC drone cameras can make the horizon look curved or distorted, but not with this one. And you can control the camera’s angle merely by moving your thumb within the piloting app. To get your quadcopter to take off, simple tap the button in the app. With just another tap, you would have automatically landed it. You can download Free Flight Pro from the App Store or Google Play. You can also add FPV glasses for a totally immersive flight experience once you’re back home and viewing the videos. There is also a subscription called Flight Plan where you can create your own flight plans with altitude, speed, and camera angles. 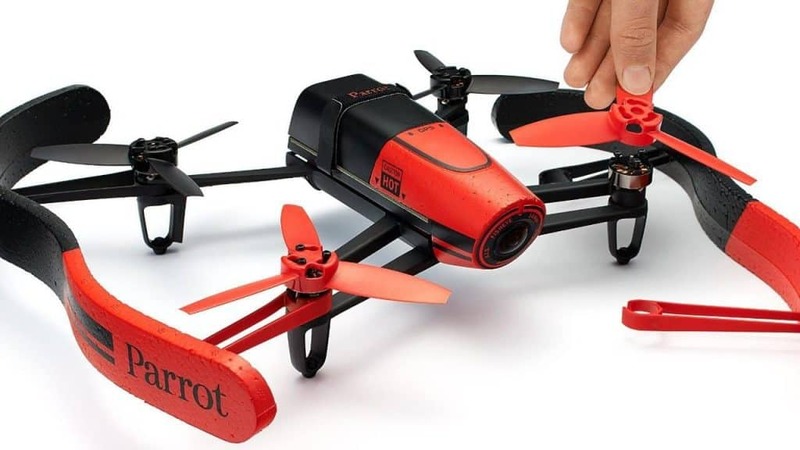 The Parrot Bebop is one of the most affordable aircraft on the market today, however, the camera is built-in, so there is no option to swap it with another, or to install a Go-Pro setup. The camera is also immovable and can only take shots at one angle. Like other long range drones for sale this quadcopter also runs with the use of an app that can be intalled on your smart phone or tablet. You’ll need to ensure that your OS is up-to-date, and that it can run the app before you purchase this quadcopter long range. It can be a love or hate relationship with the absence of the radio control unit. The Bebop may be more suitable for those who don’t understand the nuences of RCU and prefer the simple controls on the app. The Phantom 3 Advanced long range drone is made by DJI. This quad has a pro look with shiny white body and two silver stripes on each arm. It has a camera support and a camera that hangs directly from the underside, with two protective legs on either side. Not only is it easy to fly, but it’s also simple to do takeoffs and landings. It’ll respond to your commands while still maintaining a stable but safe flight. This quadcopter can stay in the air for 22 minutes and be controlled out to a range of 2000 metres. The 3 Advanced Quadcopter has been designed with an intelligent battery. It has a higher voltage and more power to get your long range rc drone to long distances without dying. It has built-in sensors and bright LED lights so you can keep an eye on your battery pack’s remaining power. Plus, your Phantom 3 is constantly calculating its distance from you and how much power it has left so you’ll be able to safely bring it back to you for recharging. The Phantom 3 Advanced has a great GPS-assistance hover mode. This is perfect as it’s one of the long distance drones that can plot its own location so you’ll never lose it. It can compare its location with yours and its hover mode will enable it to move more accurately. It plots its course by locking onto a satellite with GLONASS. It doesn’t matter where you are in the world, there are 36 different satellites available to you. And like the other long range drones for sale it also works with an app: DJI Go. You can view a map of your surroundings and see exactly where your quadcopter is located. You can also record its takeoff point so if you tap the return home button, it will come flying back to starting position. It compares well to other long range quadcopters as it has an advanced vision positioning system and continually processes information as it flies. It can do complex calculations in real time. All of this adds up to a great worry-free experience. There is even the capability to reviews your drone’s range flight logs. Not only does it log and record it all, you can bring up details of flight route, flight time, flight distance, flight location, and any photos or videos you took. This long range drone for sale will be able to follow your commands instantly. You can also set your controls to your preferences. If you let go of the control sticks it will simply hover in position. There is also a return to you function which works with the press of a button and will return to starting position and land safely. You have the choice of operating your Phantom 3 Advanced with an app or with the radio remote controller unit. However, the unit is a separate cost and not included in the price. You do have the ability to control your camera from the app, including camera tilt and angle, and switch between photos and videos. It’ll record your moves and is a lot like having your personal film crew. Having the ability to access all your data in your app will also help you to recreate future videos. The GPS is only available when your drone can connect to a participating satellite. This quadcopter can last on one charge for 23 minutes and can fly out to a distance of 2000 metres. The other manufacturers of other long range drones may be more popular but it’s worth taking a look at the Xiaomi Mi Drone 4K. Xiaomi has another version of the Mi Drone, but this is the 4K one. This has a higher and better HD image transmission. The Mi Drone has an all-white shiny body with four white rotors. It also has a circular style of camera with two long legs that protect it on either side. It has big LED running lights on the underside of each of the arms. The body is lightweight but high-strength. The propellers are airfoil and ARA-D. The goal of Xiaomi was to create a drone that even the beginner will find easy to fly but at a reasonable price. This quad has a radio controller unit that the expert will have fun using but also has auto controls so it will do the flying for you. The camera has an integrated PTZ camera with high-quality 4K and 1080p video. The camera has a low level of distortion so you’re ensured of capturing the best images. It has a real-time image transmission so you can watch on the screen to see what your Mi Drone is capturing. You’ll get clarity in every pixel that the camera records. 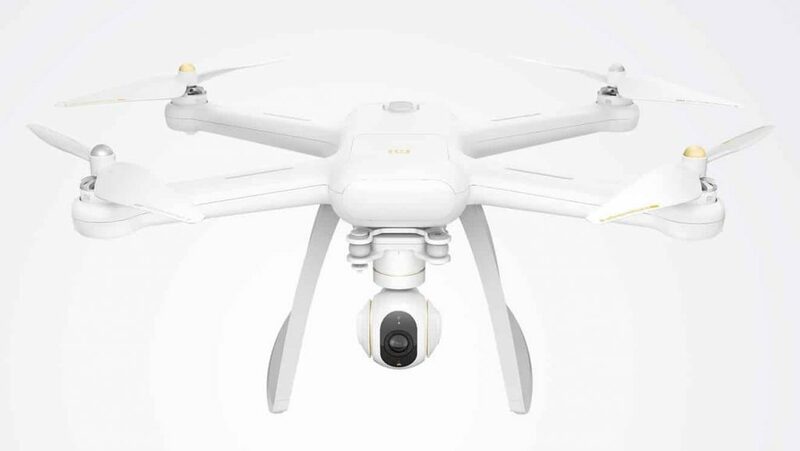 The Xiaomi Mi Drone 4K has a three axis mechanical image stabilization technology for the motor. The motor is also brushless. The quad will hold the camera steady even while in flight. The Xiaomi Mi Drone 4K has a microchip that is able to calculate motion changes and drive options in real time. It also has GPS and utilizes the GLONASS tech. With the application you can set up a variety of flight plans and automatic takeoffs. You can also preset the Xiaomi to automatically land at certain times. You can also set up a destination where it can land. This gives you a chance to enjoy the live streaming video feed rather than having to focus on the controls. There is also an automatic return, should you be tired of flying and want to let the Mi Drone do all the work for you. The auto function lets you choose a certain point and then have the Mi Drone automatically fly around it. You begin by selecting the center, choose how high you want to fly, and then the radius. This Mi Drone also has the “follow me” function. You synchronize it with your smart phone and then as you walk, drive, or bicycle, the Mi Drone will follow along behind you. The Xiaomi operates with a combination of the radio controller unit and your smart phone or tablet, which installs at the top. There are some basic joysticks and controls on the unit, but most of your intricate flight operations will be done in the app. The advantage is that all your video and snapshots will be recorded so you can view and edit later. The Xiaomi Mi Drone 4K has an impressive run time of nearly twenty-seven minutes which is often only available in the more expensive quads. It also has some great flight controls. Any cons may lie in its lesser known name, and that there are no camera choices or ability to swap them out, but as it gains popularity and has more drone models on the market it will be exciting to see what else is released. The Phantom 3 Professional looks a lot like the Phantom 3 Advanced but it has two gold stripes instead of two silver ones. It’s built to respond instantaneously to your flight controls, from takeoff, to flying, and landing. Not only that, but it has a great safe and stable flight system. This Phantom 3 practically flies itself which is good new for the beginner. 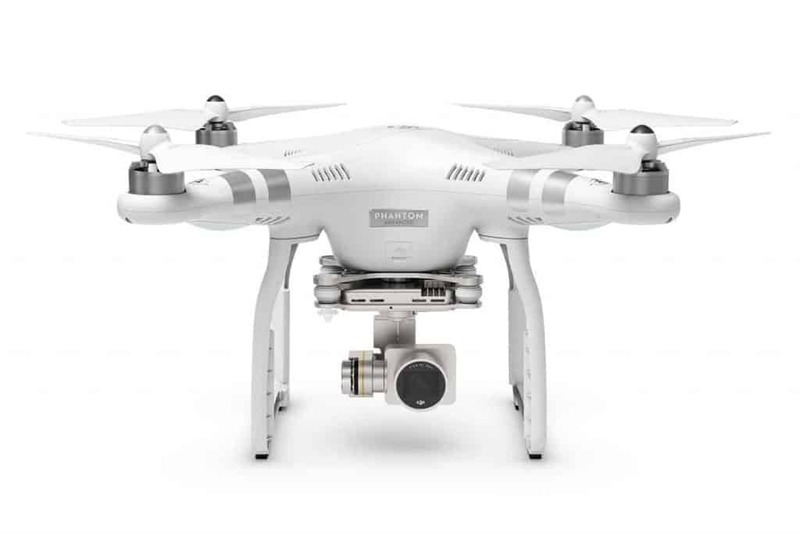 The Phantom 3 Professional is built with an advanced and upgraded battery. It has built-in sensors and also LED lights that tell you how much power is left. Your Phantom 3 Pro will calculate how much charge is left and how much time to return, so you won’t have to worry about it. The propellers are self-tightening so you’ll never need to fiddle with them. They provide additional boost and thrust to keep the Phantom on a stable flight path. The Phantom 3 Pro operates with an app or a separate radio control unit that’s not included in its price. Like the Advanced, the Pro has the same GPS-assisted hover mode. It will also move more accurately and be able to lock onto satellites if one is within range. GLONASS gives it the choice of 36 different satellites from around the world. You’ll operate your Phantom 3 Pro with the DJI Go app. It can track the location of the Phantom 3 Pro on a live moving map. It will record the takeoff point so you can do a return to home function with only the tap of a finger. The vision positioning system will help you to fly your quad. It does this by processing info from each of its sensors, then does calculations in real time. The quadcopter can also record automatic flight logs. You can review flight logs in your own time and see your complete flight route, time, distance, location, and photographs and video of your adventure. All that information is available for viewing at any time with the advanced flight records. You can also share the info with DJI’s support team if you need help. There are four different motors built into this quad. They are brushless and have fast ESCs (Electronic Speed Controllers) to make your Phantom 3 Pro agile and responsive. The motors will help to get the Phantom 3 Pro up to speed, decrease altitude when necessary, hover in place, or return to home. The powerful air braking system will stop your Phantom 3 immediately. Hovering in place will be exact, without drift. The Phantom 3 Pro will follow your commands in real time. You can also customize the control settings. Your Phantom 3 Pro will stop and hover in place if you release the control sticks, and has the return to home functionality. This quad has an IMU—Internal Measurement Unit—which is inside its gyroscope. This will record and relay the tiniest changes in the tilt and movement of the quad. It never stops working and will compensate for them automatically. It works in the background so you don’t need to do anything. The Pro costs a couple hundred dollars more than the Advanced. Much of the difference lies in the look and the built-in IMU gyroscope. It has a more powerful battery pack too. Other than that, almost everything else is the same. The Phantom 3 Professional goes as far as the Advanced to a distance of 2000 metres and runs for 23 minutes on one charge. Lovers of the DJI Phantom line will have to decide if the few extra features are worth the additional cost. 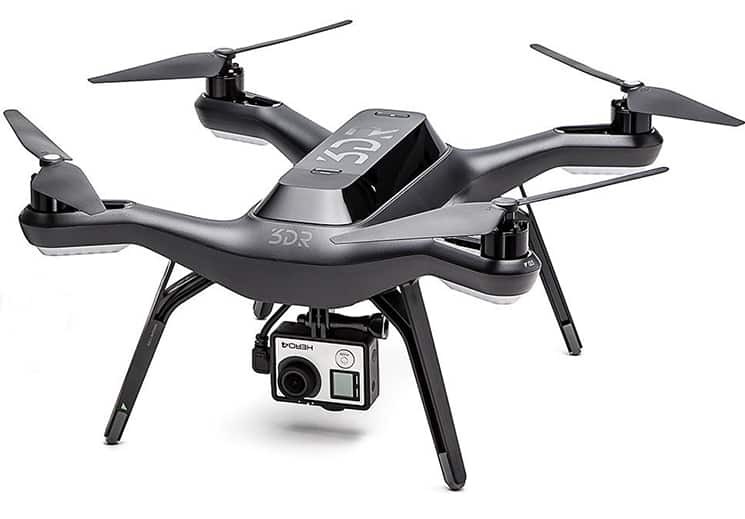 The Yuneec Q500+ is a discontinued drone but you may be able to pick it up at a discount. It has some great features for the commercial pro that are worth checking out. This Yuneec Q500+ has a white plastic arms with black central body. It’s been built in much like an “H” shape. There is some realism in it’s shape, rather like looking like an airplane or space shuttle. Yuneec wanted to have a slightly different shape than the other quads on the market in order to stand out. Like the other drones on this page, it has the camera that hangs down from its centre. It has a unique banded design that enables it to be lightweight, with four white propellors. It comes fully assembled from the factory. It has also been test flown to ensure that they have released the best product. This Yuneec Q500+ comes with a white radio controller unit called the ST10 transmitter and Personal Ground Station, with handle, and a small view screen. The whole kit comes in a durable black aluminum case so you can get it safety to the field. Everything is included so you don’t need to purchase anything separately, including batteries. The battery pack slides in and out easily with a handle. There are two batteries in the kit you buy, so you can have double the flight time on the field. This kit can record full HD 1080p FPS video and takes great 12 megapixel images that can be viewed right on the screen. You can take video or still photos with the press of a button on the screen of the ST10. There is also a slider located to the left side of the ST10 controller so that the pitch and tilt position can be adjusted. There are some interesting flight features included with the Q500+. There is a smart mode which is perfect for beginners. It is built with a GPS antenna, compass sensor, and WiFi link. There is also a geo-fence that acts like a virtual barrier so that the quad will never go beyond it. The GPS will take over and will establish an eight metre circular zone around the pilot. The toy will never fly beyond this zone so it will ease the worries that the beginner will lose it or crash it. Smart mode also means that the toy will move in the direction you push the control stick without worrying about nose first. It will also hold its position and maintain a level altitude when the joystick is in the centre. There is a Follow Me function where the Yuneec Q500+ will follow behind you as you move ahead. Once the beginner has improved they can switch to the pilot or angle mode. This is the mode used for aerial photography. You’ll need to get the nose oriented forward, and then operate the joysticks accordingly. You’ll be able to fly to further distances and do steeper bank and pitch angles. Your camera will record faster planning and tracking shots. The home mode is a safety feature that can be activated at any time. You simply flip the switch and the Q500 will return to you. This is also handy for beginners who are hesitant to try a landing yet. 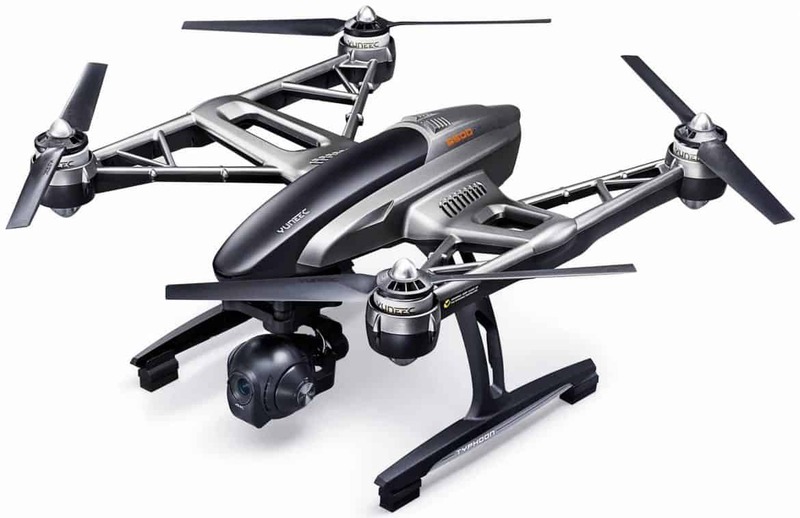 The Yuneec Q500+ will return to its home point and land within three metres of its original starting point. The Q500 will also return to you at any point that it begins to lose its signal with the transmitter. This will prevent you from losing it, or having to worry about flying it out of range. The return to home function will activate and safely return home to you. It has a good twenty to twenty-five minutes of flight time. Of all the long range drones for sale, Yuneec isn’t as well known in the European or North American markets so it may be overlooked. But it costs less than the Phantom 4 or the DJI Inspire 1 so may be a more affordable solution for the budget-conscious business. It doesn’t have quite as long a flight time at twenty-five minutes, as the DJI Inspire, but is still good for the price since it does also include two battery packs, the Yuneec Q500+, the camera and the radio controller unit with view screen, along with a variety of other accessories. Despite this, some people may also be cautious in this purchase has the model has been discontinued. Phantom offers many choices for the drone buyer, but the DJI Phantom 4 seems geared more towards the pro pilot. There are some nifty features in this quad that make it more than a beginner’s model that you grab off the shelf at your local toy shop. 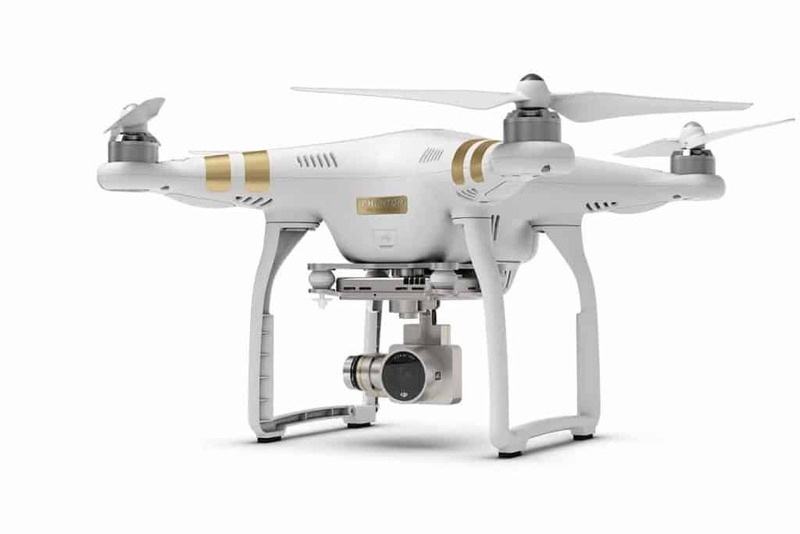 The DJI Phantom 4 is all-white quadcopter without the silver or the gold stripes of the Advanced or the Pro. It does still come with a great camera and running LED lights. But its look doesn’t indicate all the great features that it has been built with. The Phantom 4 is made from new revolutionary materials and a better agility than the other Phantoms on the market today. It’s built with a magnesium skeleton that has reduced its weight, but is still strong and resistant to vibration. The inner core has been been designed to lift the centre of gravity more towards the centre, which has resulted in an improvement in balance. There is also a camera on this quad that has a 720p HD ability. The Phantom 4 pilot can switch between flight modes so no matter if you’re a beginner who needs intelligent navigation, or an expert seeking the faster speed with smoother movements for filming, Phantom has got you covered. This quad has an advanced precision hovering system mode (VPS) that enables it to stay in one position in the air. It doesn’t need a GPS system. It’s also easy and safer to fly. This system will allow it to break instantly to prevent collisions after you have released the joystick controls. If it gets pushed out of its position, it will return to the original hovering position by retracing its path. There is a simple tap to fly mode. All you do is double tap the screen and your Phantom 4 will rise up into the air. It also has an obstacle sensing system which will enable it to steer clear of any objects in its path. And it only takes one tap which will enable the return to home function and bring it safely back to starting position. It has a great sports mode. This means that when you turn it on, you’ll have the best flight control. Not only will it be more agile but you’ll be able to fly it at speeds of 25% faster than the beginner’s mode. But even in sports mode your Phantom 4 will run on a positioning system that will still keep it safe and well-controlled. There is also a visual tracking mode. This mode will track your toy while its moving with only a few taps. You’ll turn on moving POI which will circle around your toy as its moves. It will also reframe your shot by dragging the subject on the screen. You’ll also get an extended flight time of 28 long minutes. This is about 6 to 8 minutes longer than the other Phantoms on the market today, or 25% longer than the Phantom 3 Professional. It can be flown out to a distance of five kilometres. There aren’t too many quads you can take out of the box, charge up, and have such a long flight time. Often the average is only six to eight minutes. Don’t be confused by the names: Advanced, Pro, or 4, the 4 has the most features of the line and also has a higher price tag of nearly $1500. 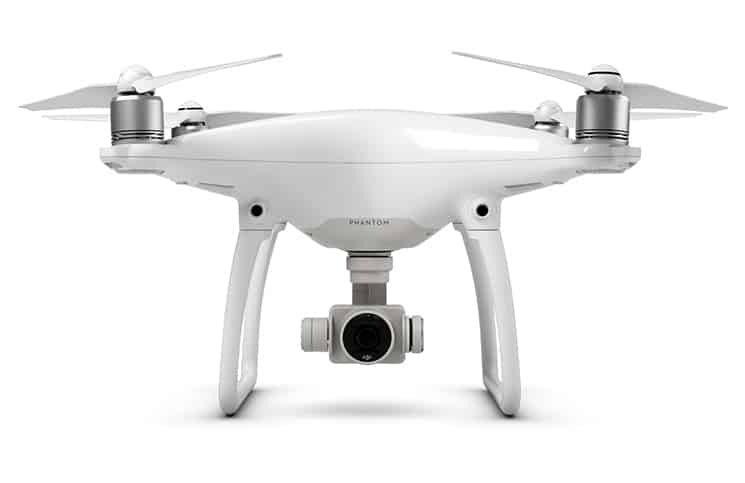 But if you own any type of business that relies on running a Phantom 4 to record great photographs and footage, this may be the best option due to all of its amazing features, including a longer flight time. 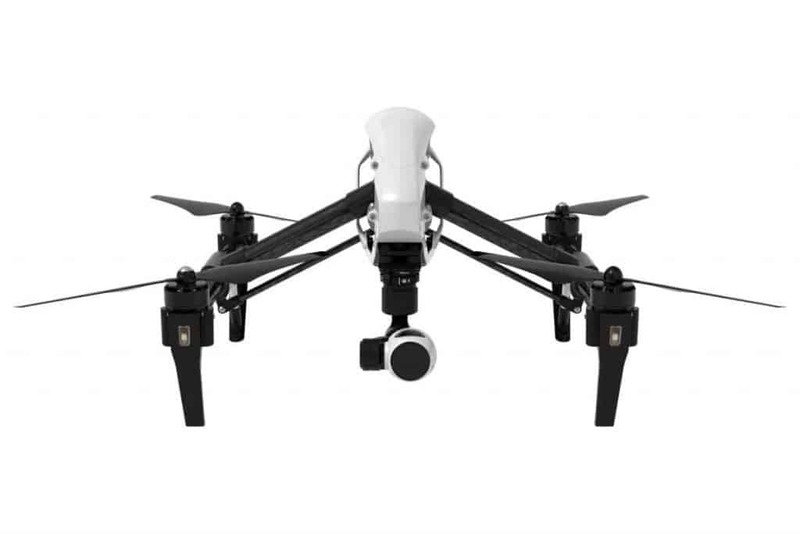 Besides DJI’s line of great Phantom quadcopters there is also the DJI Inspire 1. They’ve marketed this one a bit differently. They combine advanced technology with creativity. This DJI Inspire 1 looks a bit rougher than the Phantom line. It has a white plastic body with four black carbon fibre arms that are covered in a strong reinforced material. The four quad arms have large black rotors with legs below that surround and protect the camera. These are thirteen inches longer and have a unique DJI “Z-Blade” design. This aircraft has been designed for agility and durability rather than trying to impress the client. It comes out of the box ready to fly, so there is no need to build or attach anything. The photographer or videographer will love how they can choose from five different cameras that all attach to the Inspire. There is the Zenmuse 1, Zenmuse X5, Zenmuse X5R, Zenmuse XT, and Zenmuse Z3. DJI has created an all-in-one flying platform so that creative people can have fun with their projects and not worry about all the technicalities of flying. There is a built-in flight simulator so you can actually practice how the controls work and get a feel for everything before you really fly. The Inspire is designed to get you in the air fast and up to speed quickly, so you can focus more on your creativity. There are some powerful motors built into this aircraft but it still has a lightweight frame that’s flexible. There is also stability built in, which is essential when taking great aerial footage. The DJI Inspire has been billed as the company’s most advanced and complete package. Not only do you get great aerial technology, but the choice of a great camera too. There is also a worry-free autopilot so you can turn it on and watch your copter soar through the air. Or, you can turn it on and focus on watching the film it records, and take great snapshots. The Inspire runs with the DJI Lightbridge controls on your smart phone or tablet. The Go App provides a live streaming HD view of the footage you are filming or the snaps you are taking. Of course you can simply enjoy flying too. The Go App also has an easy video editor so you can place your film clips together and make a complete video for your project. One unique and extremely impressive feature that blows the others away is the ability of the DJI Inspire 1’s legs to raise up in the air after flight take off. This allows an unimpeded 360 degree view for the camera. You can access this feature at the controls. This also gives you the chance to film no matter which direction your are facing, nose forward or not. The DJI Inspire had been designed for artists, much like the Apple or Photoshop has been, but it comes with a steeper cost of around $1900. This is the DJI Inspire 1 for the creative person who doesn’t want to learn about aerodynamics or tech, they just want to get out and fly and take great aerial footage or snap some great shots. The cameras record at 4K video and 12.4M photos which is the best. It may not be for the person who enjoys the joysticks or traditional type of radio controller. You also won’t be buying this DJI Inspire 1 for its looks but it has an excellent durability to protect it and the camera from damage, should it hit an obstacle. All of the drone manufacturers offer comparable product quality, including Parrot, DJI, Xiaomi, and Yuneec, so if we set aside brand reputation, we’ll want to narrow it down a bit more than that. All of these products have great cameras, and most have the basic functions such as return to home or beginner and expert modes. We’re not ranking any of the products on looks, as that is an attribute best left to the toys, rather than a tech toy that is used for commercial purposes. While these are the seven best long range commercial drones, they are only in this article for comparison, and each are still good in their own way. There are also many others available for sale beyond this set of seven that have a great drone range. For commercial usage, cost is not a big factor unless it’s over $2000, but all of these choices vary between $250 and $1900. The Parrot Bebop is just a bit too much of a beginner’s toy to be a whole lot of use for the professional videographer. It places at 7 in the rankings. Neither the Phantom 4 or the the DJI Inspire 1 have been designed for the toy market as they’ve been engineered for the creative business professional that requires a drone to extend their client services. If you’re in the market for a great long distance drone be sure to do your research first, particularly if the livelihood of your business counts on it. 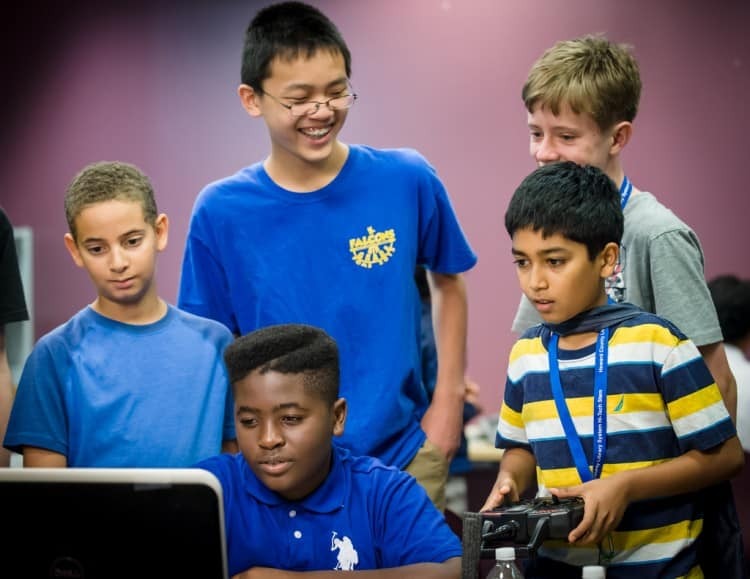 And be sure to go beyond the features of the quadcopter and examine the camera too. A great quad will have an adaptable frame that allows you to attach and detach the digital video camera. Many pros have an assortment of digital cameras based on different purposes. Here is the table with the final results of the 7 best long distance drones. Whilst we aim to provide you the best priced products in the market in 2018, there are always special occasions like Black Friday & Cyber Monday where, all products are available at an extremely discounted price on Amazon through deals.